The above photo was taken on a night drive while on safari in Mashatu Game Reserve in eastern Botswana. While cheetah normally hunt by day as they use their vision to find prey, they will also hunt at night if there is sufficient moonlight. 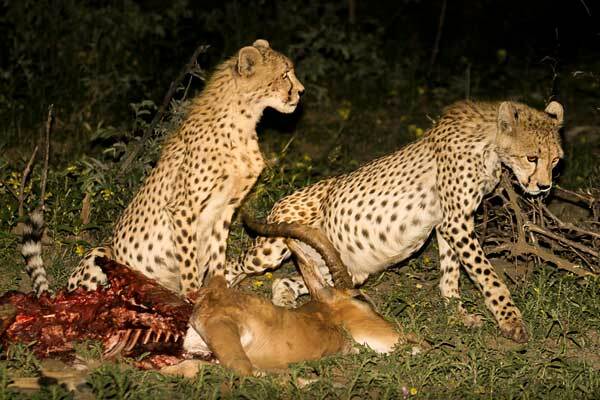 It's also possible that these cheetah had killed the impala an hour or two before, while it was still light, and were now feeding on their prey in the dark. The photo was taken using a spotlight on the game drive vehicle as the main light source, while some fill-in flash was used in addition.